The development of technology and transport service concepts as well as the evaluation and testing of their effects are involved in automatic driving. The change in the Finnish legislation now allows automatic driving pilots, and Tampere city region is one of the forerunners in the field. In Finland, we’re doing it the most advanced way and our researchers are among Europe’s best when it comes to observing the environment and artificial intelligence of the vehicle. In the Nordics, challenging weather conditions may bring extra twist to the development work. Autonomous minibuses have entered the cityscape in Helsinki, Espoo and Tampere to help solve the challenges of city transport. The goal of the experimentation has been to find the best applications for automatic buses in the near future regarding fluency, safety, and user experience of passengers in city traffic. Tampere city is a suitable test area for the development of automatic driving since bus data can be displayed on a map. We also have an intelligent traffic light system, intelligent streetlights, and lots of sensor expertise in the region. Further, we have investigated how to accommodate autonomous buses to the transport system and what kind of possibilities they offer to the system’s feeder lines. The automation of passenger cars in city traffic is also studied in the Tampere region. In addition to the functionalities and situational awareness of the automatic vehicles, the tools and methods that make testing easier, such as wireless communication between vehicles and observation of the environment, are being developed in the region. A test area for automatic driving, where the autonomous vehicles can drive in real traffic, has been established in Tampere. The purpose of the area is to find out how an automatic passenger car operates e.g. at intersections with traffic lights, or in car parks and tunnels. The route includes both city and highway sections. At first, the communication between the vehicles and the infrastructure, as well as map services, are developed in the test area of three autonomous vehicles. The goal is to create real services and autonomous vehicle functions for end-users. Autonomous mobility creates a real opportunity for companies to develop new product and service ideas. The needs can relate to optimizing parking areas for autonomous vehicles, updates, or the quality of map data, to mention but a few. 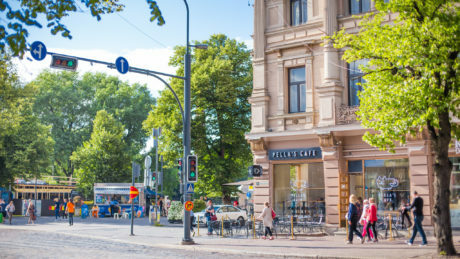 Tampere city is of a suitable size for the testing of transport products and services whilst being sufficiently compact for agile and flexible decision making and functional cooperation between the public and private sectors. Smart Tampere is all the innovative development and smart city solution creation that happens in the Tampere Region. The programme brings together the parties that develop digital services, products and processes, and the people that use them.